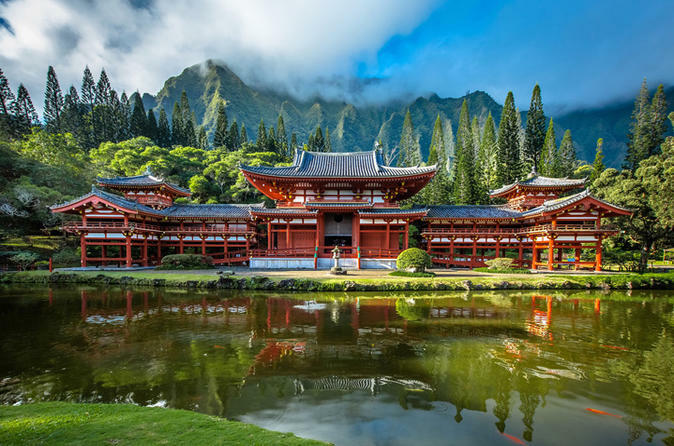 This intimate and luxurious full day (8-hour) circle island Oahu tour is perfect for anyone wanting to see Oahu’s top attractions including stops at Dole Pineapple Plantation, North Shore beaches, Waimea Valley, Pali Lookout, and of course Oahu’s famous windward beaches. You will not miss out on any of the action by choosing this tour, your professional tour guide will lead you on a journey including a professional narration of Hawaiian history and top tips at every location to maximize your day in paradise. Limited to 11 guests per tour to provide a personalized experience. Pickups at all locations in Waikiki and at Kahala Resort. Begin this amazing adventure with a complimentary hotel pick up and instantly relax as you as you ride comfortably in our Mercedes Benz tour vehicles featuring panoramic windows and an entertaining and informational narration by your professional guide. This tour will take you from the hustle and bustle of Waikiki to the pineapple fields in Central Oahu where you can visit the world famous Dole Pineapple Center. Explore Oahu’s majestic North Shore with a special lunch at Waimea Valley - not only famous for many Hollywood films but also one of Oahu’s most scenic tropical valleys and waterfall. Your afternoon in paradise holds nothing back as well with visits to mountain top lookouts, secluded white sand beaches, and a drive around the jagged peaks that make up the Koolau Mountains. Not only will you get to see the turquoise waters and white sand beaches of Hanauma Bay but you’re afternoon will also be spent enjoying Diamond Head beach lookout as well before being dropped back off at your Waikiki Hotel. This popular tour is a great way to experience Oahu’s top attractions and really get the most out of your day. With return times early enough to catch a Luau, Dinner Cruise, or night out on the town, this tour is a great way to spend your first couple of days on Oahu.